As we dive deeper into the digital age, younger children now called “technology natives.” They don’t remember a life without digital devices and are accustomed to online life. Despite being familiar with this brave new world, today’s kids are still susceptible to the potential harms new technologies can bring. A key example? Cyberbullying. 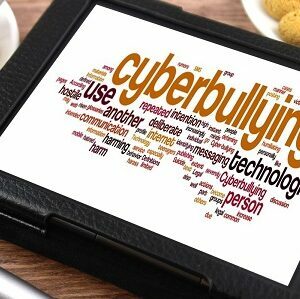 Cyberbullying is any type of bullying that takes place over electronic technology. Examples include spreading rumors online, sending malicious texts, and posting embarrassing content. 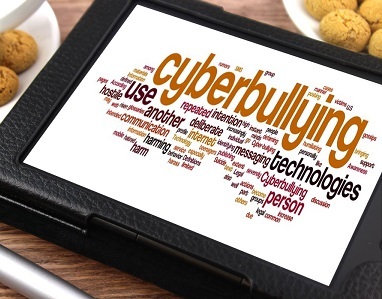 This means rather than being vulnerable to bullying only when they’re with peers in-person, teens and pre-teens are now followed by the 24/7 threat of cyberbullying. With cyberbullying, it is also harder to delete any inappropriate content, and kids can often post these hurtful posts anonymously. And if you think the amount of bulling is going down over time, you’d be wrong—one study showed that rates have only increased since 2010. In good news, this is a great month to check-in with the teens and pre-teens in your life about their on and offline habits because October is National Bullying Prevention Month. And, it’s not too late to join in the different activities to raise awareness and help combat the problem. Monitor their online activity and let them know if you are doing this. If you see something alarming, sit down with your child and talk with them about it before reporting it or jumping to conclusions. Make sure your child has their privacy settings on. On social media sites, this helps prevent strangers from reaching out to harm them, or it can prevent peers posing as strangers from gaining access to a profile with the intent to hurt someone. Make sure your child knows how to block or report a cyberbully. Here are links to doing this on Facebook, Instagram, and Twitter. But also, make sure your child knows how to block a number on their phone, as many forms of cyberbullying happen over text messaging. 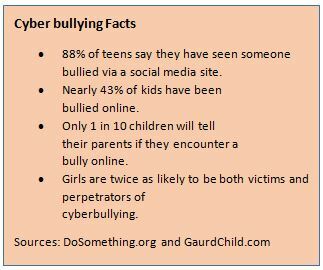 Talk with your kids about cyberbullying and see what they know and don’t know. Together explore gov to learn more about cyberbullying, how to prevent and respond to it, and who it effects the most. Medical procedures and increased safety regulations may be protecting kids from harms of the past, but it takes new approaches to help them deal with to new threats. Together, children and adults can band together to speak up and end the spread of this bullying epidemic. Have any other tips for stopping cyber bullying that have worked for you? Leave them in the comments below!